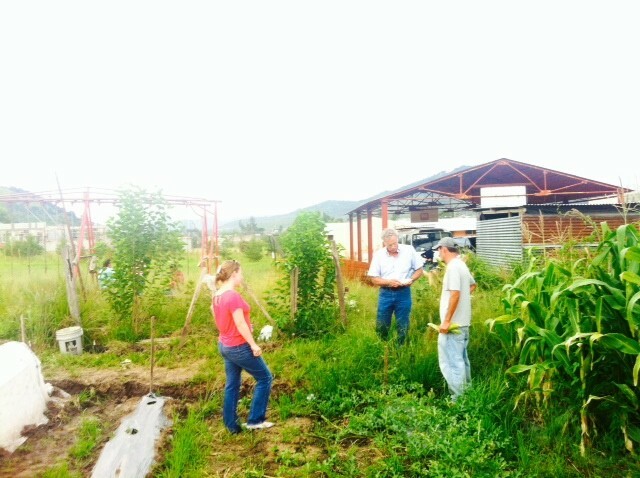 How are things at Casa Hogar in Jalapa? This September a team from the HEAR Foundation visited Casa Hogar to check in on the girls, inspect any work that needs to be done, and hear from the home’s residents themselves how they are faring. We got about a million hugs in the process and left energized and excited about what new year will bring. The home is growing and thriving, the crops are blooming, and the girls got a good laugh out of our attempts at making jewelry. Our visit fell into the midst of the rainy season, and water issues and solutions for them dominated most of our time. Of course our first visit was this the girls and their concerns, after which we went on tour around the premises. 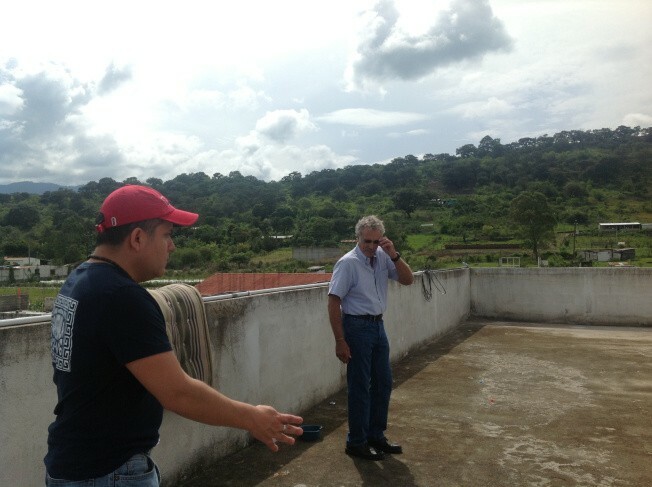 Visiting the farm with Mr. Cerna. The farm is thriving in Mr. Cerna’s capable hands. A beautiful new corn crop was about a month shy of harvesting during our visit, and it is soon to make way for a string bean crop for commercial sale. Over the course of this year, Mr. Cerna and the girls have combined forces to grow over 17,000 lbs of produce! Our focus for the coming season is to improve the irrigation system. We are working with local contacts to find an inexpensive, organic solution that will give the home one more push toward food independence. Rain in Jalapa falls up, down, and sideways, and that means that any surface exposed over the long haul will show some rain damage. Here, HEAR Director Jim Ziemba and our local translator and guide Mr. Pablo Castañeda are inspecting the roof surface and developing ways of preserving the structure better. We have various options on the table, and once the rainy season ends we should be able to come up with a more permanent solution. A volunteer trip is planned for February 2015, and if all goes well the home will by consistently dry and ready for a fresh coat of paint by then! Karen focused on her craft. It was a special privilege for us this year to be able to visit the Milagros workshops and witness the girls creating jewelry and accessories that they designed themselves. HEAR could not be prouder to have been a part of a truly functioning business endeavor that gives these young women the skills and experience to work toward independence. Thanks to the partnership with Trades of Hope, the girls are now selling enough for the program two hire two of them as on-site managers, an amazing step for them and a huge inspiration to the other girls. Check back here in a few weeks for an update and link to Milagros’ new website! The entire home prepared a big celebration and send-off for us, and we found ourselves especially charmed by the tiniest performers. Here’s to a good 2015! P.S. : Want to support these wonderful young women? Come celebrate with us at our annual fundraiser on December 13 at the Montgomery Club in Chicago!